In robot mode, the program works completely in automatic mode, without intervention. 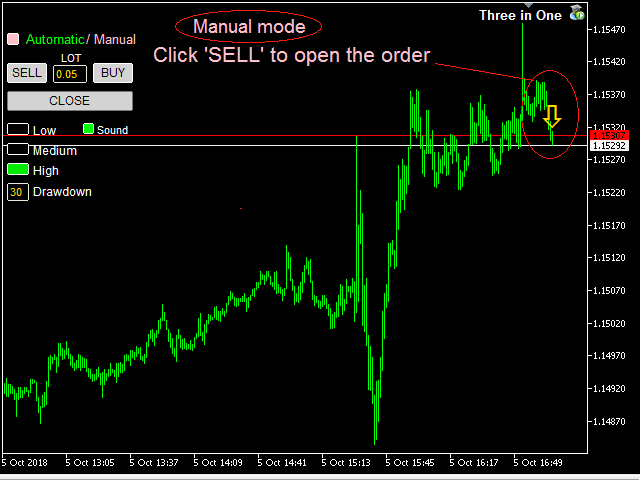 It is enough only to choose a mode of profitability: Low, Medium and High. Recommended currency pairs: EURUSD, GBPUSD, EURCAD, EURGBP, USDCAD, AUDUSD, USDJPY, EURJPY, AUDJPY, EURAUD, USDCHF, NZDUSD . . .
A standard trading account is recommended: Standard without commission. Works on any time frame, with a leverage from 1:25, but recommended 1:100 or higher, with quotes 5 (3) after the decimal point. Minimum deposit of $ 500, recommended from $ 2000. Account currency: USD, EUR.